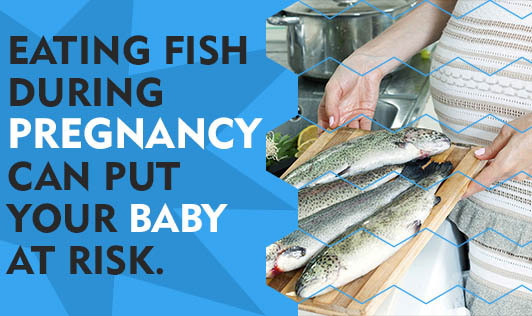 Eating Fish During Pregnancy Can Put Your Baby at Risk. Are you confused, whether eating fish or any other seafood during pregnancy is safe? Then, you are not alone. It is important to understand the guidelines relating to fish intake in pregnancy. It is true that seafood is a great source of protein, iron and many other vital nutrients required for the development of the baby. It is also known that omega 3 fatty acids present in the fish promote better development of brain. But certain types of fish, particularly the predator fishes like shark, sword fish, king mackerel and tile fish may contain high levels of mercury. Mercury in sea foods is not a matter of concern in adults. But pregnant women and those planning for a pregnancy should stay away from these. When fish high in mercury is consumed regularly, it can accumulate in your blood stream and affect your baby's brain and nervous system development. • To reduce exposure to mercury, avoid large predatory fish. • To avoid ingesting harmful bacteria, viruses avoid raw fish, shell fish and mussels. • If you are buying fish from local waters pay attention. They might be contaminated with biological chemical and industrial pollutants that can cause potential hazards in the growing baby. • Fish should be thoroughly cooked at a high temperature. Fish is done if it appears opaque throughout and the flakes separate. The vital nutrients of fish, the omega 3 fatty acids can also be obtained by consuming vegetarian sources like ground flaxseeds, soya bean oil and walnuts. Make these a part of your daily diet. As long as you avoid fishes that are high in mercury or those contaminated with pollutants, it can be a part of healthy menu in pregnancy. Be sure you buying fish from a reliable source!